The very first job I had was in a small restaurant in Scotland, under the guidance of Scott Lyall. He is fantastic at training young chefs, many of whom have gone on to have great careers. Scott would be very influenced by current French trends, researching, tasting and then developing his own recipes. He was a great influence on my early development and I really enjoyed my time there when I would make these tarts with him. This is also a favourite of chocolate connoisseur Sara Jayne Stanes. • You will need 15–16 tartlet tins measuring 7cm (2¾ inches) in diameter and 3cm (1½ inches) deep (see page 224). • The pastry dough and the cooked sponge can be made in advance, wrapped well and frozen. Preheat the oven to 160°C (325°F/ Gas 3). Melt the chocolate over a bainmarie (water bath) to 45°C (113°F). Take off the heat, add the softened butter and stir until fully combined. Add the egg yolks and mix until fully incorporated. mix until smooth. Carefully fold in the remaining meringue. Increase the oven temperature to 180°C (350°F/Gas 4). Using silicone (baking) paper, line the pastry cases and fill with baking beans. Bake in the oven for 15 minutes. Remove the silicone (baking) paper and baking beans, then return to the oven and continue to bake for a further 10–12 minutes until golden brown. Cool on a wire rack and remove the casees from the moulds. Put the cream, sugar and liquid glucose in a saucepan and bring to the boil. Gradually add the cream to the chopped chocolate, mixing continuously to form an emulsion and use immediately. Pour the basic ganache using a jug into the base of each tartlet case until one-third full. Place a chocolate sponge disc on top of this. Pour more ganache into the tart until it reaches the top of the tart. Transfer to the fridge to set for about 20 minutes. 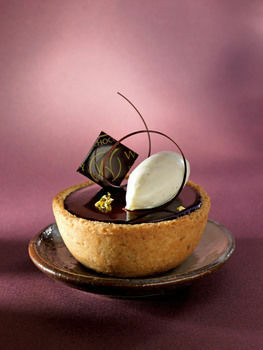 Carefully spoon a thin layer of the chocolate glasage on top of the tart and leave to set. Make the crème chantilly and shape into quenelles. Place the quenelles on top of the tart and decorate with chocolate decorations and edible gold leaf.